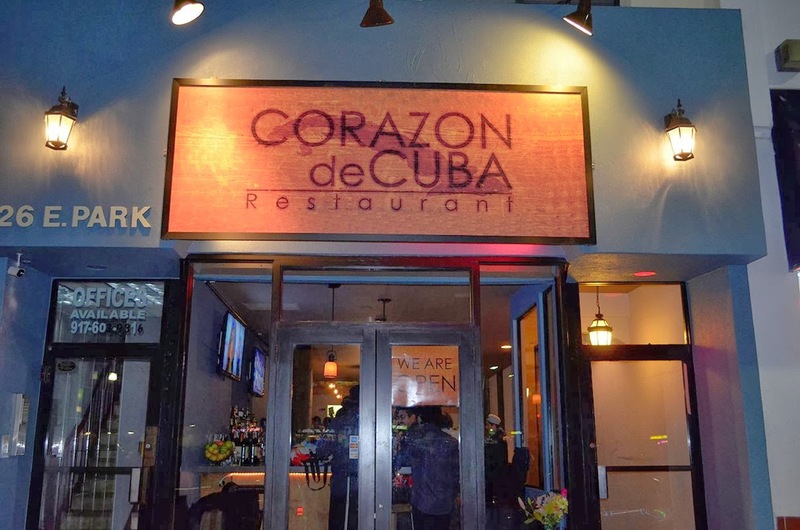 Last night we checked out one of Long Beach, New York's newest restaurants, Corazon de Cuba. Located on Park Avenue in the center of town, across the street from the train station, Corazon de Cuba is small but full of life, warmth and excellent food. Everyone we encountered, from the bartender to the manager to the servers and busboys, was extremely friendly and accommodating. The server knew the menu very well and thoroughly and patiently answered all of our questions. He also sold me on the fish of the day, the grouper. We started with drinks at the bar, which is located right in the front of the restaurant. The bar is long, and surrounded by beautiful rustic wood stools that were actually very comfortable. The bar also has purse hooks underneath - a huge plus in my book! 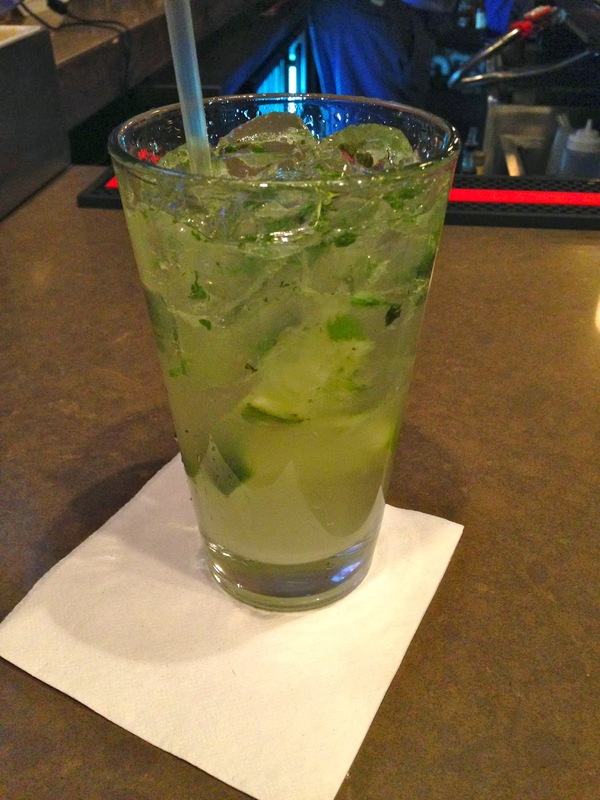 The mojito was a very good, classic version of this minty, sugary rum cocktail. 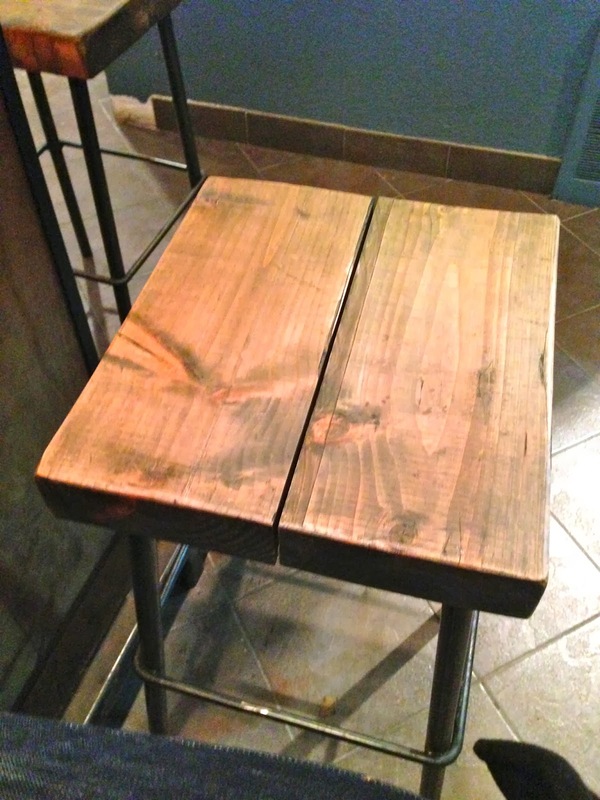 I love these bar stools! There are two levels to the restaurant, the bar and a few tables on the first level, and then you walk up three steps onto the second level, where the majority of the tables are located and the kitchen is at the back. One wall is exposed brick and the other has built-in dark wood shelving. In the upper dining room, where we sat, the recessed pressed-tin ceiling is a beautiful accent to the space. Lively latin music was playing, and we were told that they have live music most weekends, but unfortunately not last night. Picadera Cubana: A sampler of five appetizers: two empanadas, chicken wings, corn on the cob, ham croquettes and shrimp fritters. We got a Beef Empanada and a Chicken Empanada, and loved them so much that we just had to order more of them! The beef filling was seasoned ground beef in a savory sauce, with black olives. The chicken was in a tomato-based sauce with peppers and onions. The empanadas are served with Habanero Corn Cream - which is to die for. Thick, rich sour cream studded with bits of corn and habanero for heat. It is so rich, creamy and delicious with the perfect amount of heat. I wanted to put this on everything! My second favorite item on the platter was the Chicken Wings Corazon de Cuba - they were similar to buffalo wings but instead of buffalo sauce they were seasoned with a spicy creole seasoning and sauce. They were a very good alternative to the traditional hot wing. I would not order the Ham Croquettes or the Shrimp Fritters again. The ham croquettes were extremely salty - all I tasted was ham and nothing else. Nothing like the rich, creamy croquetas at Plancha in Garden City. The shrimp fritters had a nice shrimp flavor but were otherwise dry and under seasoned. The corn was nice - tiny little pieces of corn on the cob topped with cheese and spicy seasoning. Like I said, we liked the empanadas so much that we had to order more - there were four of us and we each wanted our own! So we ordered one of each - beef, chicken, shrimp and broccoli and cheese. The shrimp was really good, very similar to the chicken, in a tomato-based sauce, and the broccoli was paired with a sharp cheddar cheese, also very good. Do not miss the empanadas! Fish of the Day: Fresh Grouper served over sauteed spinach and topped with an avocado-mango citrus salsa. This also came with a side of yellow rice and black beans, as if I needed anymore food at that point! This was my first time having grouper, and I loved it! It was like a cross between Chilean Sea Bass and halibut, a mild, firm white fish. The sauteed spinach was very garlicky, just like I like it, and the avocado-mango salsa on top was the perfect accompaniment. My only complaint about the fish was it could have used just a touch of salt or lemon. I grabbed a lemon wedge from my husband's dish and squeezed it over the top, and it was perfect! The plate was also beautifully presented. Vaca Frita: Translated as "fried cow," this dish consisted of shredded slow-cooked skirt steak which had been marinated in lime, garlic, onions and cilantro and crisped over high heat. 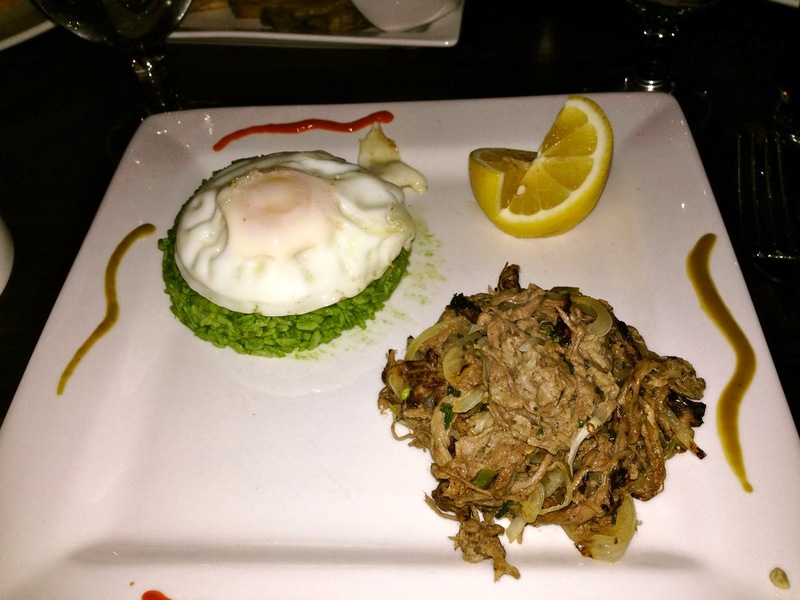 It was served with a round of "green rice," which is seasoned with a lot of cilantro, and topped with a fried egg. Not only was this dish very pretty, it tasted great too. It tasted like a beefy version of carnitas, a crispy shredded pork dish popular in Mexican cuisine. 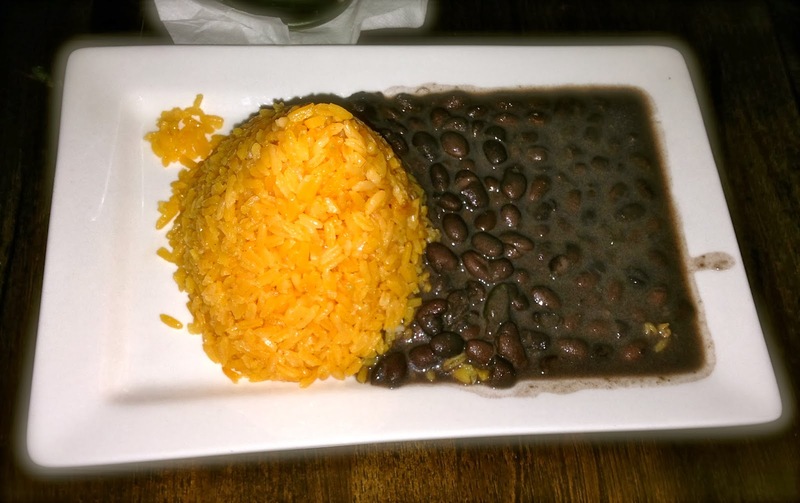 What I really liked about all of the dishes at Corazon de Cuba was their presentation and the fact that the portion sizes were not overwhelming like many other latin restaurants. 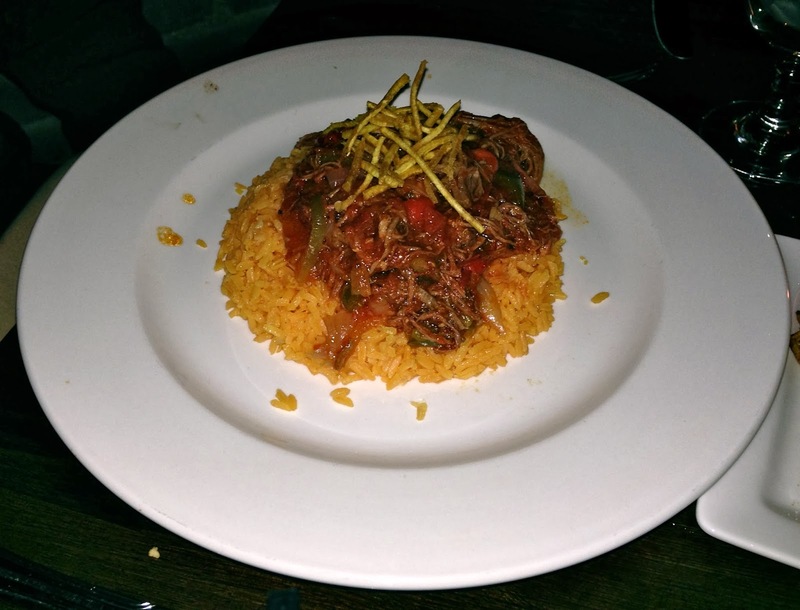 Ropa Vieja: Meaning "old clothes," (based on an old story about a poor man who turned a pot of clothes into beef stew), this is a classic Cuban dish of shredded skirt steak with onions, bell peppers and plum tomatoes. It was served over yellow rice and topped with what I believe was crispy matchstick-size yuca. The meat was rich and tender and full of flavor. I would definitely recommend ordering the Ropa Vieja. Churrasco: Cuban style skirt steak marinated in salsa borracha ("drunken salsa"), served with chimichurri. My friend substituted plaintains for the rice and beans. This steak was extremely tender and flavorful, and the chimichurri (garlic, citrus, herbs, olive oil) was a nice dipping sauce for the meat. After all that delicious food we had no room for dessert, but the Cafe con Leche (basically a cafe latte) was excellent! The coffee was very strong but had a great, deep flavor. Next time we will save room for the Pastelitos, sweet empanadas filled with rice pudding and topped with strawberry sauce and vanilla ice cream!